UNE is delivering leadership skills to scholars from developing countries in support of Australia's overseas aid work. Image: Dr Peter McClenaghan of the UNE Business School, an international authority on corporate leadership, introduces John Allwright Fellows to their task as future leaders in their developing nations. The following op-ed by Professor Mingan Choct, Pro Vice-Chancellor - External Relations, appeared in The Australian on April 3, 2019. Money and knowledge have for decades been the twin currencies of Australian international aid, but there is a third element necessary to make these contributions work as intended. By supplying it, we hope to open up new ways of thinking about the nation’s aid program. That element is leadership. There are so many ways of defining leadership that an internet search produces results like, “The 100 best ways to define leadership”. For our purposes, the definition produced by the Leadership Institute at Harvard College is a good fit: “The skill of motivating, guiding, and empowering a team towards a socially responsible vision”. The Australian Centre for International Agricultural Research (ACIAR) has come to believe that it is not sufficient merely to share technical knowledge with partners from developing countries. To maximise the return on aid investment, we need to also train them to be leaders. With this objective, ACIAR is working with the University of New England (UNE) to open a fresh chapter in Australia’s aid program by equipping Australia Awards scholarship students from developing countries with leadership skills. ACIAR’s brief over its 36 years of operation has been to use as agriculture as a lens for aid initiatives directed at poverty reduction, food security and the generation of sustainable livelihoods across more than 30 Indo-Pacific nations. Along with the altruistic principle of a wealthy country helping the people of less prosperous countries, it is an investment in science-based diplomacy aimed at tackling shared problems, including biosecurity, human health and climate change. One of ACIAR’s most important programs is the John Allwright Fellowship (JAF). Since 1986, hundreds of overseas researchers have been granted generous Fellowships so that they can acquire post-graduate training (mostly at Masters and PhD level) in Australia. Underpinning the scholarship is the rationale that Fellows will return to their organisations and work their way up to a position of prominence, from where they can disseminate their learning and become part of a regional leadership alumni with close ties to Australia. This rationale has been proven to be well-founded: many ACIAR-supported alumni are now in senior positions across the region. However, not everyone is born to be a leader, and even those Australian-trained researchers who have risen within their organisations face personal and cultural challenges that can constrain their influence. Seeking to maximise the long-term influence of Fellows in positions of leadership, ACIAR has decided to teach researchers leadership skills in tandem with their Australian postgraduate degrees. 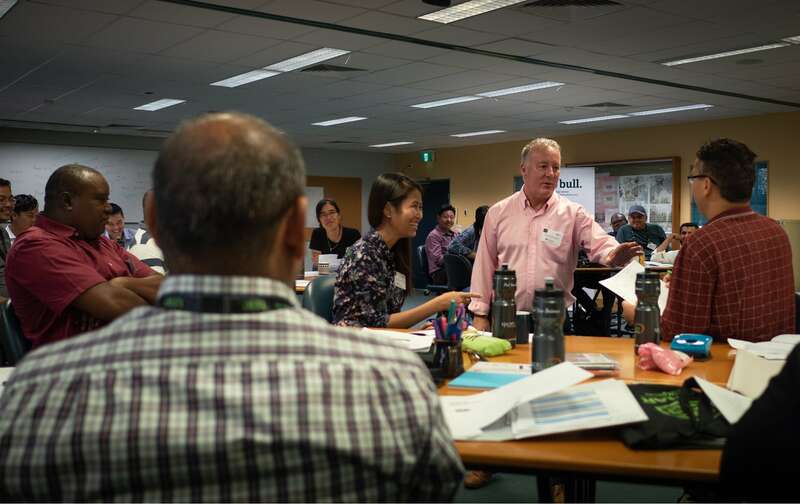 After an extensive tender process, ACIAR chose UNE to write a curriculum and deliver training in executive leadership and management to an initial cohort of 50 John Allwright Fellows. The first 24 JAFs began their training on January 2019. UNE’s guise as a regional university obscures its substantial international footprint, built on the strength of its pioneering work in distance education. It has since the 1960s built an extensive alumni across the Indo-Pacific and Africa in countries as disparate as Indonesia, Nepal and Bhutan, and Nigeria. UNE academics set to work on integrating this cross-cultural understanding with its Business and Social Science School’s expertise in organisational leadership into a 15-month intensive course. As they go about upgrading their research credentials, John Allwright Fellows are now also absorbing timeless principles of leadership: about the determination to get the best out of oneself and invest that learning into bettering a community or workplace. They are also learning that modern leadership requires a true commitment to diversity across genders, cultures, ages. JAFs are early- and mid-career researchers, and their presence on the scholarship program indicates that they already carry some of the traits of leadership — self-awareness, an alignment of personal and organisational values, an ability to build teams, and strong communication skills. It will take several political cycles before we fully understand the implications of this initiative. However, independent evaluations of ACIAR investments have repeatedly shown a very high return on this form of aid. International aid delivered as agricultural science – a key strength of Australia - is an intergenerational investment, regardless of how it is packaged.